This chapter introduces the reader to a nonlinear mathematical model of an electrostatic vibration energy harvester and how it is developed. Semi-analytical techniques for analysing the dynamical behaviour and stability of the systems are introduced with particular emphasis on the harmonic balance method, the multiple scales method and the mechanical impedance method. These methods are compared and different ways to visualise and interpret the results of both numerical integration of the mathematical model, and the semi-analytical techniques are presented. 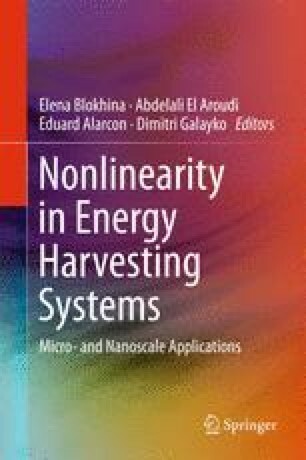 Although the chapter is primarily focused on a gap closing eVEH operating in the constant charge mode, the material studied gives the reader the necessary tools to analyse and model any eVEH with nonlinearity present in its system. Hilborn, R. C. (2000). Chaos and nonlinear dynamics: An introduction for scientists and engineers. Oxford: Oxford University Press. www.summon.com.